Congress must do more to stimulate hiring in the private sector or face delaying the recovery of the U.S. economy, Federal Reserve Chairman Ben Bernanke said Friday. The AP reports Bernanke held out the prospect of further Fed actions to help the economy but offered no new plans. Bernanke singled out the debt ceiling debate and the downgrade of the U.S. credit rating as causes of delaying recovery. 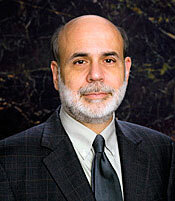 The downturn in the housing market has also delayed recovery in the broader economy, Bernanke said. The economy grew one percent in the April-June quarter, according to a report from the Bureau of Economic Analysis released Friday.